Goed verblijf hier gehad, nu verder Bali verkennen. Erg mooi gehad hier een knus hotel. Nous avons passé un merveilleux séjour au TAMUKAMI. L' Hotel est authentique et charmant , la cuisine exellente et le personnel adorable. Nousreviendrons c'est sur. Beautiful hotel, thanks to Dic Paul for recommending it. Lots of laughs and bintangs. So close to everything and everyone. A very memorable holiday. So hard to leave, but will be back. Terima Kasih! Everyone with beautiful smiles. We have enjoyed a very relaxing time in this beautiful hotel. Great staff, lovely garden. Beautiful place, just a shame we could only stay for a short time. Time to go! We're had a great time ! Very friendly staff and helpful. Beautiful setting. Thank you for everything. As always we had a great time at Tamukami. It really is a place in paradise. We have stayed here many times and love all the staff and rooms and food are great too. See you next year. Thanks for the stay. We enjoyed it here. Friendly staff and nice atmosphere. Thanks to all the very nice. ALWAYS SMILING . Very friendly people at your FLEMISH/BALINESE Hotel. This gives a special feeling.... a bit like home. Dank voor de vriendelijke ontvangst en goede zorgen. Mercy pour l'accveil chaleureux et toutes les prestations du " TAMUKAMI " . Très bel hôtel et le personnel est charment . 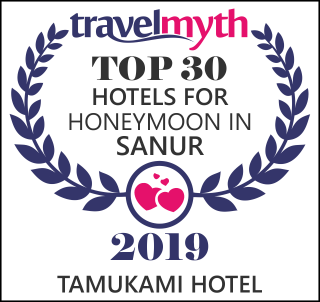 Nous recommenderons l'hotel à toutes Les personnes que nous connaissons et qui souhaitent venir à Sanur. We have a seaweeds bussiness. We are going to the north Bali island and Surabaya. We think Bali is favorite island. We hope we have a many chance to come to Bali island. Fantastic Hotel! One of the best places we have stayed while in Indonesia. We are looking forward to coming back. Great Hotel. Very friendly staff. Had a great time. What a fantastic introduntion to Bali. Wonderful hotel & even better staff! I will be back soon i hope! Vier dagen zijn we in Tamukami geweest. Heerlijk hotel. Lekker eten, prachtige bloementuin en natuurlijk de vriendelijkheid en Zorgzaamheid van het personeel. Zeer de moeite waard om nog eens terug te komen. Thank you for a wonderful stay. Your hotel is very beautiful and the staff provide exellent service. We are so happy we were referred to your hotel buy Karen Storey. If we come to Sanur again we will stay here and we will tell our friends to stay here too. Absolutly beautiful, staff so very friendly.The hotel is fantastic, good food, good accomodation and so relaxing. We have booked already to come back again next year. The best hotel in Bali. Denise et Joelle ont eu de Bali cette premiere vision d'un Jardin magnifigue qui semble eternellement fleuri..... des sourires de l'humilite' et de la grāce de ses habitant c'est eci! Thank you once again for a wonderful holiday, beautiful room kept spotleesly clean, ever smiling & laughing with staff, wonderful meals, great massages, look forward to coming back again. Kita mengucapkan terima kasih atas semua. Semoga kita bisa bertemu lagi dan menikmati liburan di hotel ini. I enjoyed my stay in TAMUKAMI with the host Mr & Mrs. Eugeen De Geest. Hospitality and personal touch is wonderfull. We enjoyed the massage and the nice swimming pool here. Once again we have enjoyed the warm welcome of helpfulnes of everyone here. Many thanks. Very nice place ! We enjoyed everything. Sehr nettes Hotel in best en lage. Schonen Abschluss unseres Urlaub auf Bali. Thank you for great hospitality and excellent service! 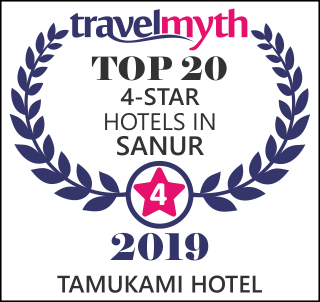 The front desk staff were really exceptional at helping with my various challenges.... we'll certainly will be recommending Tamukami to our friends! The hotel is very cosy and the personell is really friendly! We felt welcome and relaxed. Thanks for a ,nice stay- Tamukami feels like an oasis in the middle of Sanur! Als vorige keren even een korte stop maar zoals altijd perfect. A great place. We stayed in a suite and think it was better than a 5 STAR HOTEL. We had a wonderful stay- but too short. Friendly people. .Nice breakfast! And the suite is very good. Clean and nice swimmingpool. We were unlucky for the weather : much rain but we had a pleasant stay. Heel goed hotel, lekker eten & vriendelijke mensen. Het restaurant is een aanrader voor jong en oud ! Ons vaste logeeradres bij aankomst en vertrek : altijd een succes. Alweer hartelijk dank voor het prettige verblijf en ditmaal in het bijzonder voor het feestje voor onze Tom die hier eergisteren 6 jaar is geworden! Tot volgend jaar, hopen we ? We had really fun time. Thank you so much to friendly staffs and other costumers. See you again. We zijn heel blij in dit mooi, knusse hotel te mogen logeren! Ci siamo trovati davvero bene in questo hotel. Les raggaze della reception sono carinisseme come tutto il personale. Un Posto il dove tornerenao. Excellente nuitt et très bon répas, service impeccable. Merci beaucoup..
Merci pour cet excellent séjour dans ce cadre magnifique..
Une addresse à faire connaitre à tous. Merci pour votre accueil et ce très bon restaurant ! Zeer leuk zerbleif met zeer leuke mensen!!! Wonderful hotel – nice landscape, big room & great host. True paradise! Wonderful staff- so lovely & friendly. Will certainly recommend this hotel to all my friends in the U. K.
Many thanks. Wonderful place to be. Très beau & agréable séjour ans ce petit coin de paradis. Een oase op een onverwachte plek. Lekker eten en zeer vriendelijke bediening. Kortom , alles wat ge van vakantie voorsteld. Trés agrèable séjour, le personnel est trés gentil et souriant. Hotel magnifique, magique et reposant.....a recommander chaudement sommes enchantés de notre séjour. Vriendelijke gastvrije mensen in een heerlijk relaxse omgeving. Cher Monsieur, je tiens à vous remercier pour l'excellent accueil que vous nous avez réservé. Votre hotel nous a beaucoup plu : calme, à taille humaine, très bien situé, une piscine merveilleuse entourée de beaux jardins, des chambres spacieuses et très propres, un personnel sympathique et serviable, etc ... c'est exactement ce que je cherchais. Encore merci et à l'année prochaine car j'espère bien revenir. Hello to Tamukami staff and owners. We had a delightful and wonderful stay at your resort in Sanur, Bali. This was the final leg of our trip in Bali. We wish now that we had came here for the entire stay. The setting and surrounds of your resort was very lovely and peaceful. The staff were always happy and helpful. The restaurant and bar served wonderful food and beverages. The occasional live music was also well chosen. There were also the frequent and welcoming hello's from the owners and the flawers in the evening was a sentimental personal touch. We will leave with very nice memories of this beautiful resort and its people. Thank you for a most wonderful time at your lovely resort. The staff were all extremely friendly and higly professional. We were also impressed with the hospitality from the reception by staff to the frangpanis in our hair ever dinner. Everything was done to make guests feel welcome. Thank you once again, we will recommend you to all our friends. Bedankt voor een heerlijk verblijf hier in het Tamukami in Sanur. We hebben genoten van de vriendelijkheid van iedereen en van de gastvrijheid. We zullen jullie aanbevelen bij onze vrienden. Merci beaucoup, c'était super içi: une belle piscine, du calme, une bonne nourriture, des chambres agréables et les gens de l'hotel très gentils, En Gros : Terima Kasih. Je me suis beaucoup amusé ici Merci beaucoup. What a wonderful place. Excellent staff. Very, very friendly. This was our second stay at your lovely hotel, and I feel that it was even better than our first. The staff and facilities made us feel very at home. Tamukami is one of the greatest attractions in Bali. Thanks. Nos quatre derniers jours à Bali ont été très agréables. Cet hotel est très paisible. Le personnel est toujours souriant et près à l'écoute de nos besois. Merci pour tout. A bientôt on l'espère.